Wat Pho- Bangkok’s oldest and largest temple and home to the Reclining Buddha (150 feet long). Make sure and see the statues of the Farang guards at the inner gates- they have big noses, beards and top hats. 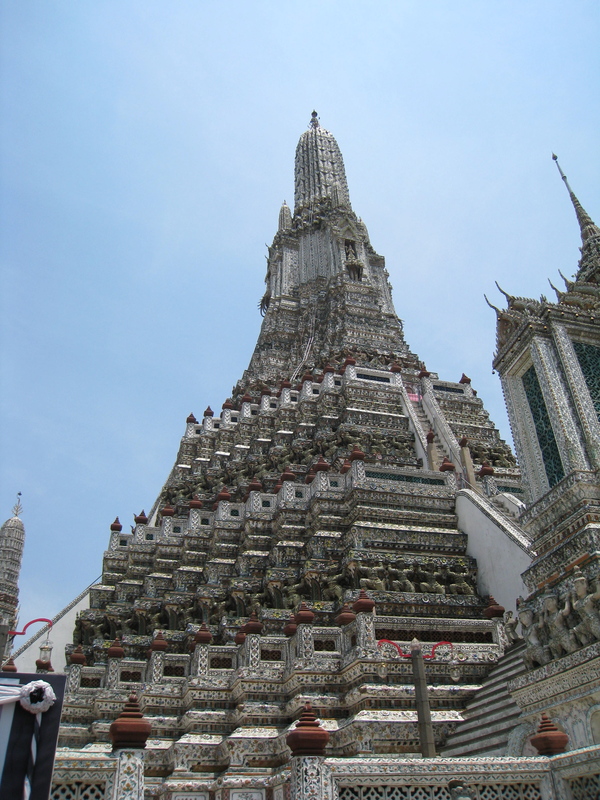 Wat Pho is home to the Institute of Massage and a traditional medicine center. After Wat Pho, head to the river, find the Thien pier and take the boat across the river to Wat Arun. Note- around the Thien pier there is wonderful Thai massage and food. Wat Arun- this is the image on the Ten Baht Coin, best first viewed from the river and is probably the most famous of all river photographs from Bangkok. Take the boat from the Thien pier, great photo ops while you cross the muddy river. The Wat is named after Arun, the Indian god of dawn. The monument is large- 768 feet wide at the base and 260 feet tall, you can climb a steeeeeep set of stair to just over 140 feet high; the stairs are meant to be steep, they represent the challenges of reaching higher levels of existence. The monument is gorgeous, colorful porcelain is used to decorate the entire monument with rows of demons that are amazing. Wat Saket and the Golden Mount- beautiful golden tower on top of a man made hill, a nice Wat and some of the best views of the Grand Palance, Wat Pho and Wat Arun. Note- you need to climb a number of stair to reach the top. Baiyoke Tower- a good way to see Bangkok from above. There is an observation platform- that revolves- on the 77th floor. Go in the late afternoon and stay until the sun has set. Night Bazaar at Lumpini Park- this is now closed. Head to the weekend market. Weekend Market (J J Market)- massive, massive market. Anything and everything you want and cheap. Siam Paragon Mall & Central World- large malls full of international brand names, movie theater and food court. A good place to walk around and shop if you need to jump out of the heat. Siam Paragon is off the Sky Train Siam stop, Central World is off the Sky Train Chid Loam stop. MBK Center- need electronics? This is the place. This place also drives me crazy, loads of people in small isles. But, if you want to build your own blackberry and bling it up, this is the ideal place. Traditional Thai Massage- a must, I go two times a week. You will be stretched, pulled and massaged for 2 hours and feel about 2″ taller upon completion. Tips- don’t go to the spa in your hotel, you will pay 4 times the standard price and receive the western version of a Thai massage. The most popular place for a massage is Healthland: http://www.healthlandspa.com/home.html A 2 hour massage in a private room is THB450. 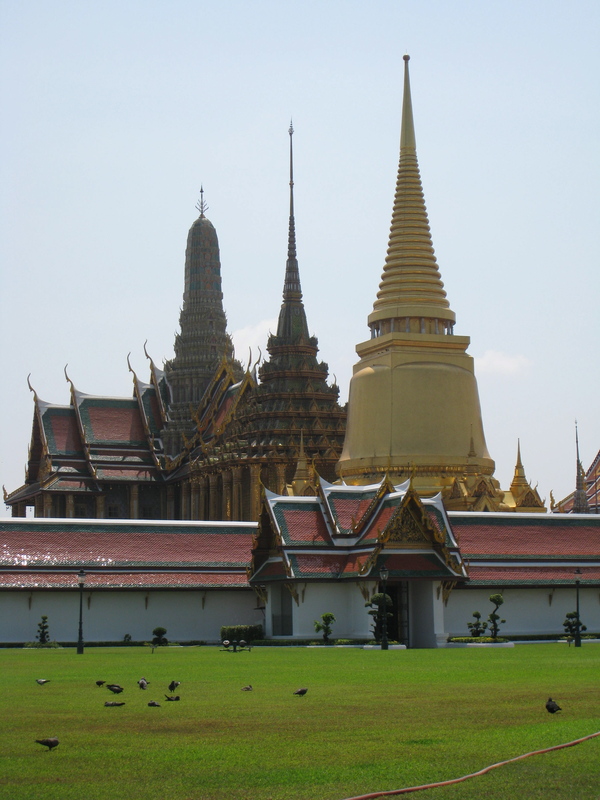 Lumpini Park- wake up at 6:45a.m., throw on some shorts, grab a taxi and just say Lumpini Park. You need to be in the park by 7:15 to 7:30. Walk around, see all the people running, doing yoga, thai chi, fan dances and just walking and talking. The fun is at 8:00 a.m. sharp- the clock tower bell will chime the eight bells and everyone stops- everyone including you. The Thai National Anthem is played, without everyone standing still. Even the traffic police and whistles will have stopped. The Anthem ends, whistles start, people resume walking, talking and eating. Simply awesome. Make sure and look on the banks for the lakes for the lizards. You have a nice website and I like reading it. The local Thai people always make me happy. Even when things are difficult or challenging, I often see a little of the Thai spirit smiling through. If you want to be ripped off, go to MBK. You’ve never heard of Pantip Plaza? Platinum Fashion Mall? Zeer Rangsit? Yaowarat road? Klong Thom? Ban Mor road?